This morning, I did my House husband Duties, then got started on the Pool again, someone asked me why it is taking so long, well in part it has been because, it isn't a job I enjoy, it is necessary, and I wasn't paying anyone else to do it. The second reason is because it is fiddly, you can't rush it, or you may damage the tiles. I start as I have posted previously by digging out all the old grout to at least 2mm, to allow space for the new grout, I used the multi-tool, because it makes life so much easier, but this tool vibrates instead of cutting, and if you don't have a good grip on it, it will wander, and damage other tiles. After brushing the tiles to remove all the dust and old grout, you clean up, then mix a bucket of grout, ensuring you don't mix more than you can use whilst it is workable, then comes the fun part. Using a grout trowel you spread the grout, ensuring that all the joints are filled. 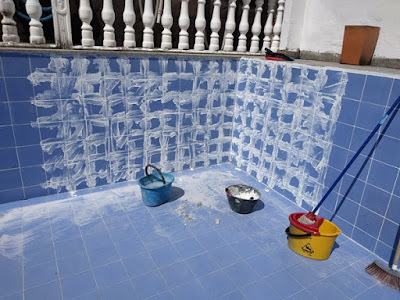 Leave it long enough to start hardening, then take a damp sponge, and wipe off the excess grout. 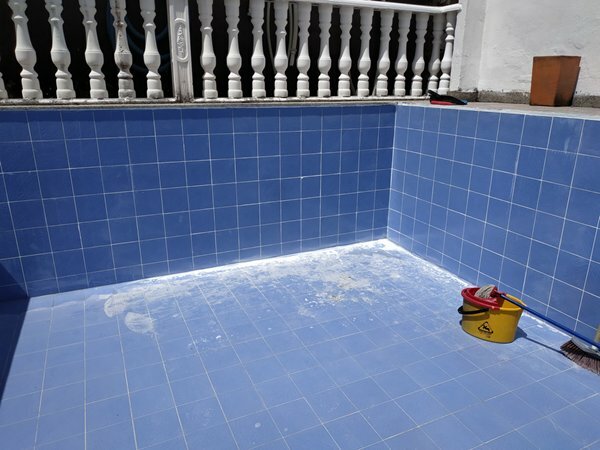 Then go over it again, removing even more of the excess, as you can see I started this as the top of the pool. 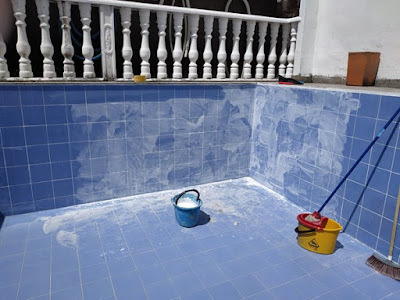 Then finally go over it with a tiling sponge (like a large scouring pad), dry, and the tiles will come up nicely, removing the last of the haze, and powder covering your work area. That just leaves the floor to mop, followed by tool cleaning, and the job is done, in this case, now all the walls are finished, I have to decide which other parts the weather will let me do, between storms, but today it has been baking, and it was even hotter standing in the pool, so I was glad to have finished, this phase. I showered, and took the montero out to fill up the natural gas tanks, on the way back I stopped off at the exhaust fitters for a check-up, as it is the annual technical revision in less than two weeks, and I suspected there may be a problem, but fortunately it turned out that everything was fine. This short trip also checked on yesterdays work on both petrol and gas system, it worked perfectly, and hopefully it continues to do so, I say that, because every time I open my mouth, something goes wrong afterwards!